Take command of controlled depth fishing when you equip your boat with a Uni-Troll™ downrigger…features an innovative design that lets you pull your lines back in with less cranking effort and One-Hand Clutch Deploy for simple precise bait positioning. Downrigger Cable - 150# Test x 200Ft. American Fishing Wire makes a full Line of Downrigger Cable assemblies. 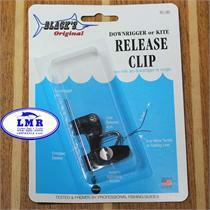 Available colors of cable are Camo Brown and Bright Silver; Unrigged and Rigged with a Swivel and Thimble ready to fish. 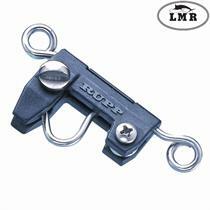 This release clip is made with the 'Ring & Snap' attaching bar for the ease and convenience of the angler to simply snap the clip in place on a downrigger ball. 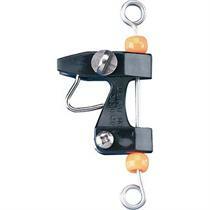 Adapts for use in 'Slider & Stacking' situations on the downrigger. 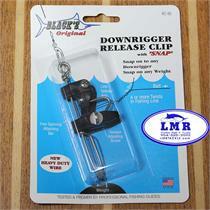 Long time standard release clip, simple proven release. Stainless, nylon and brass construction. Easy tension adjustment. For this clip to work properly make sure that the clip opens down, not up. If correct line cannot get pinched while trolling.